We are pleased to invite you to a celebration of the release of Harsu & the Werestoat by Barbara Else in Wellington and Dunedin. Thursday 4 April in Wellington: 6pm — 7.30pm at The Children’s Bookshop at Shop 26 Kilbirnie Plaza. Tuesday 16 April in Dunedin: 5.30pm — 7pm at the University Bookshop, 378 Great King Street. Refreshments will be served. In Harsu and the Werestoat Barbara has created an ambitious, original time-shifting world, built on humour, character, and drama – underpinned by a deep and ancient sense of morality. Harsu’s deliciously nasty werestoat mother sprouts fur when she is off guard yet turns plump and pretty when stealing children or eating eggs. In this book, Harsu steals our hearts, as he valiantly tries to rescue the children stolen by his mother. But he learns to use what he has inherited of his mother’s magical powers, to counter her ego-based magic, using strength he didn’t know he had. Barbara Else is one of New Zealand’s most accomplished writers for children. She delivers plot and character in equal portion, and effortlessly takes children on an adventure of foreign climes and times. 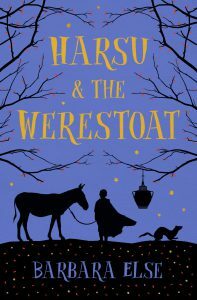 Harsu and the Werestoat has all the originality, wit and depth of character we expect from Barbara Else’s writing – but in this book there is finely honed steel also, with emotional depth and inner conflict alongside great humour, laced with fantasy and fairy-tale.